﻿In May 1942, Japanese Admiral Isoroku Yamamoto sought to draw the U.S. Pacific Fleet into a battle where he could overwhelm and destroy it. To accomplish this, he planned an invasion of Midway Island which would provide a base for attacking Hawaii. Using decrypted Japanese radio intercepts, Admiral Chester Nimitz was able to counter this offensive. On June 4, 1942, U.S. aircraft flying from the USS Enterprise, USS Hornet, and USS Yorktown attacked and sunk four Japanese carriers, forcing Yamamoto to withdraw. 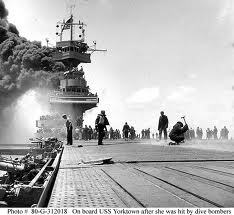 The battle lasted until June 7 and marked the turning point of World War II in the Pacific. On the morning of April 18, 1943, despite urgings by Japanese commanders to cancel a scheduled trip for fear of ambush, Yamamoto’s two Mitsubishi G4M fast transport aircraft left Rabaul. Shortly after, 18 American P-38s with long-range drop tanks took off from Guadalcanal. Sixteen arrived after wave-hopping below the radar most of the 430 miles to the rendezvous point, maintaining radio silence throughout. At 09:34 Tokyo time, the two flights met and a dogfight ensued between the P-38s and the six escorting A6M Zeroes escorting Yamamoto. ﻿ Then First Lieutenant Rex T. Barber, later a U.S. Airforce general and my second cousin, engaged the first of the two Japanese transports which turned out to be Yamamoto’s plane. He strafed the aircraft with gunfire until it began to spew smoke from its left engine. Barber turned away to attack the other transport as Yamamoto’s plane crashed into the jungle. The crash site and body of Yamamoto were found the next day in the jungle north of the then-coastal site of the former Australian patrol post of Buin by a Japanese search and rescue party, led by army engineer Lieutenant Hamasuna. According to Hamasuna, Yamamoto had been thrown clear of the plane’s wreckage, his white-gloved hand grasping the hilt of his katana, still upright in his seat under a tree. Hamasuna said Yamamoto was instantly recognizable, head dipped down as if deep in thought. A post-mortem of the body disclosed that Yamamoto had received two gunshot wounds, one to the back of his left shoulder and another to his left lower jaw that exited above his right eye. Today, biologists are waging a new battle on Midway Atoll National Wildlife Refuge in the Pacific, one of 553 refuges managed by the U.S. Fish and Wildlife Service. This time, the enemy is Verbesina encelioides, or golden crownbeard. The invasive plant is shrinking vital seabird habitat in the area where the U.S. Navy defeated the Japanese fleet in June 1942. The Laysan albatross, the large bird immortalized by 19th-century poet Samuel Taylor Coleridge, depends on the island’s habitat to nest. Two endangered species – the Laysan duck and the short-tailed albatross -have also made their home here, along with other species. from adjacent lands. Service biologists put the principle to work in the Aleutians, when they purged Rat Island of its signature rodents and the Sanak Islands of non-native foxes – also to aid seabird survival. They’re counting on it to work again. Once biologists remove the tall, dense stands of verbesina – with its rough, woody stalks – they replant the area with native plants more hospitable to nesting birds. Native plants hold island soil in place, protecting dunes and preserving and enhancing the island’s historic biological diversity. The next stage is clearing verbesina from Midway’s larger Eastern Island. That $1.8 million effort, funded by the service and private grants from the National Fish and Wildlife Foundation, is projected to take five years. For more information on the Service and this project visit http://www.fws.gov/. Thanks for noticing the juxtaposition. I feel a connection to Midway Island because of my family's history in the Pacific during WW II, and I love the birds and the Pacific Islands. Midway has been fought over and exploited and now I'd like to see it safe for the future. Another reason for my post is to pay compliments to the U.S. 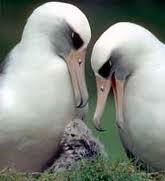 Fish & Wildlife Service for helping protect seabirds.